Entered 2007-08 as a member of a four member recruiting class for Marquette; the others are Scott Christopherson and Patrick Hazel. Mbakwe selected Marquette despite receiving offers from Iowa State and Minnesota. In November, 2007, Trevor suffered a knee injury that forced surgery. He initially decided to redshirt in 2007-08, but surprisingly returned against Pitt late in the season. He had three years remaining with Marquette starting in 2008-09, but elected to transfer the day before the 2008-09 school year began. Trevor averaged 24.3 points and 13.6 rebounds as a sophomore and 21.2 points, 12.5 rebounds and three blocks per game as a junior at Henry Sibley. He reached double figures in points in all but one game as a junior and his team posted a 17-11 record. He was invited to the Nike All-American camp and transferred to Saint Bernard's for his senior year. 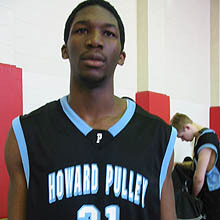 He was ranked among the top prep prospects in the nation by numerous recruiting services, including Rivals.com, Scout.com, HoopScoopOnline.com and Hoopmasters.com. He averaged 21.6 points, 12.7 rebounds and 4.5 blocks per game as a senior at St. Bernard's High School in Saint Paul, Minnesota. He shot 64% from the field and helped guide the team to a 32-1 overall record and an appearance in the state tournament semifinals. Son of Ana Davis and Marc Mbakwe … major is undecided. *According to a story written at The DoubleA Zone, the real source of the delay for Mbakwe's eligibility determination started with the fact that he didn't submit his eligibility request until September 4th, even though classes started August 22nd.